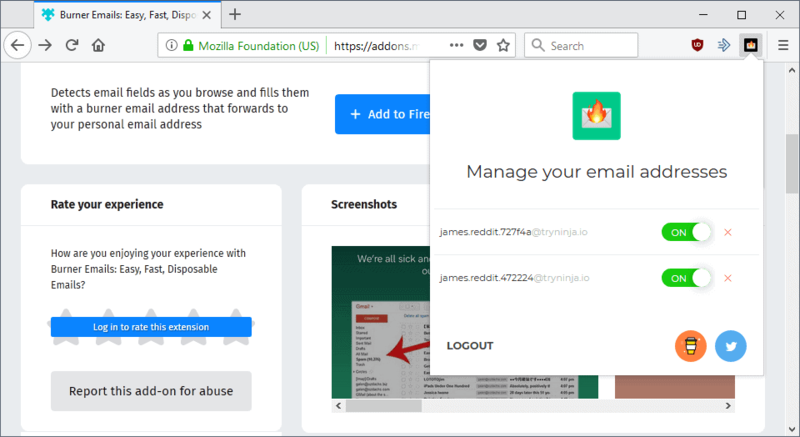 Burner Emails is a free browser extension and web service that adds options to Firefox and Chrome to create throwaway email addresses. Spam is still a big issue on the Internet and while email providers like Google or Microsoft got better at identifying spam emails so that these don't even land in your inbox, it is still fair to say that most Internet users will encounter spam on a regular basis if email is used. Throwaway email services, also known as disposable email services, come to the rescue. While you may have other options at your disposal to deal with spam, email aliases or custom domains for emails, throwaway email services like Yopmail add something to the table that these other options don't. Besides being easy to use, many require no setup at all, they are also not associated with you in any way. But there are disadvantages as well, and the two main ones are that you are not in full control of the email address and that some services don't reserve email addresses so that they may be reused by others. Burner Emails is a new browser extension for Google Chrome and Mozilla Firefox that integrates directly in the browser. Note that it requires that you create an account with the service before you can start using it. Account creation is free and it ensures that email addresses are assigned only to you when you use the service. You will notice a new icon attached to email fields once you have installed the browser extension in a supported browser. A click on the icon creates a new email throwaway email address used for that particular service. The service remembers the email addresses that it has created for you and displays them when you click on the extension icon. You may wonder how you access emails sent to the burner email; Burner Email forwards the email to the account that you used to sign up with. Note: You may leak your real email address or other personal information under certain circumstances because of the redirect. If you open the email as HTML email in your email client, you may reveal information. You may reveal additional information if you click on any link from within the email client. Email addresses that you create using the service remain available until you disable them. Just switch them to off or throw them in the trash right away to break the redirect to your real email address. Note that you can't regain access to emails that you delete anymore. Burner Emails is a useful service to create throwaway email addresses. The created addresses are not fully anonymous as they are linked to an email account that you need to specify during signup. You can use another throwaway email address for that though. The service collects some information including your email address and usage data. ..Usage Data may include information such as your computer's Internet Protocol address (e.g. IP address), browser type, browser version, the pages of our Service that you visit, the time and date of your visit, the time spent on those pages, unique device identifiers and other diagnostic data. Now You: Do you use throwaway email services? I’ve used Trashmail (https://trashmail.com/) for years, I still have the account and use it occasionally. Trashmail offers free and paid accounts and provides a dedicated Firefox webextension. Paid allows unlimited DEAs (Disposable Email addresses) and unlimited time validity. I prefer aliases over a regular email account. Less fuss when replying (reply is that of the DEA) even if TrashMail handles replying/sending via its servers). I still use, very occasionally, a DEA. Last time was when I had opened a Firefox account at AMO and realized that even though I had unchecked on that account sending of extra emails from Mozilla I’d still get a once-a-week notification from Mozilla as an incentive to open a Firefox ‘Sync’ account all with the regular blabla about the magnificence of the big Mozilla family. I closed the AMO account, opened a new one with a one-shot DEA and lived quietly after that. So a DEA can come in handy, not to mention its first purpose which is to allow a one/few instances of a dialog implemented by an email. A con for DEAs is that some sites — few in fact — refuse what they analyzed as being a DEA, which defines them, IMO, as jerks. I remember this one French TV on Desktop software company (molotov.fr ot .com, forgot) who refused a DEA, to what I changed it to a fake gmail which was accepted … jerks think like jerks as it seems. “jerks think like jerks as it seems” Funny! 10 Minute Mail (two separate services go by same name). Can extend their life in 10 minute increments. Usually not detected by website signup forms, where Mailinator and some others frequently are. Use only if you don’t care about keeping the email alive. Funny! And yeah, junk usually accepts junk, gotta think like junk. Amazing but most any email address I’ve fabricated suffixed .msn works! Just slam the keyboard and add .msn. Should try some .aol’s too. I used Mailinator for a longtime, until I started running my own mailserver. I liked it because there’s no need to even have an account. Just make up anything@mailinator.com, and if you care about replies, you just go the website and tell it what email address you used. Now I just make up one-time-use email addresses on my own server instead. I have found the Bloody Vikings add-on to work very well for this purpose. Many sites can recognize major disposable email domains so they won’t let you use those domains for email addresses. The Bloody Vikings add-on gives you a choice of more than a dozen disposable email domains. If one doesn’t work, just use another. I have used throwaways but prefer aliases. Free supersecure email services such as protonmail are useful since their spam filters are very tight; ID the reply as spam (if it arrives at all) and the sender vaporizes. I began migrating all my gmail to mailbox.org 6 months or so ago and have received exactly zero spam. Much faster than gmail, too. That’s a winner! The only reservation about free throwaways is whether they’re taking your data and somehow backdooring you in a roundabout way. For example, send a throwaway through a VPN, you’re anonymous but the recipient isn’t. Hmmm. That’s why, perhaps excessively cautious, the true email I provide to a DEA service is the address of an alias, never a main email. One never knows, in case of a problem (which never occurred here) it’s then easy to delete the alias. All I can say is that by reserving “fixed” email addresses for business, administration and “true” friends, aliases for frequently visited websites and DEAs for the remaining, I receive zero spam. Or zero+ since perfection is not of this world, and in that case I forward the raw email to ‘Signal Spam’ ( https://www.signal-spam.fr/ ), a French anti-spam center which collects spam info to counter-strike. Perhaps I missing something essential but all these acrobatics with disposable email addresses seems like a long-winded way of doing something simple. If you don’t want your real name exposed to site use an alias – outlook.com and plenty of others let you create aliases. Then, when you notice you start getting spam, set your email client, e.g. Thunderbird, to directly send those mails to the junk folder. You can even set the junk folder to automatically delete its contents every so often. Good point mentioning outlook.com’s aliases feature. I have used that. Yet perhaps a user just wants fast access to a site that requires email activation, where they don’t want to sign-in to a legit email service for whatever reason. For example, there are some systems/networks I never use regular email services on. Also, I find there’s many sites where I could care less about ever receiving any further email from. As such, for me, disposable email works great for that. Yet I think having a dedicated extension for this is rather silly, being that we have that thing called ‘bookmarks’. For my basic needs, I don’t think I would ever need a browser extension for this. I just have a handy bookmark for the service I use. Also, with this extension, it allows yet more permissions; something I would rather avoid.. I guess some folks don’t want to bother with bookmarks anymore? Hmm, I don’t get that. Reminds my of the silly app craze. In the past I’ve used Yopmail’s free service, which is great, but due to some ongoing security concerns I moved on.. If you want to know more on that, don’t take my word, rather, I suggest you do your own research and think for yourself. The disposable email service I use now is free, and to-date has passed my tests. It takes incoming email only while it’s active, and self deletes after a given time, or as long as I have the window to the service open. I’m not going to mention what this service is though, as I don’t want them added to some block list. So far, it works on all sites I have used them with. There’s a few other services much like the one I use, easy to find via Google or whatever. Error delivering email: “local-part of envelope RCPT address contains utf8 but remote server did not offer SMTPUTF8”, – If they can’t read UTF8, why to accept it during setting? Also, they got your real email address, but option to cancel account not very convincingly promised for indistinct future. 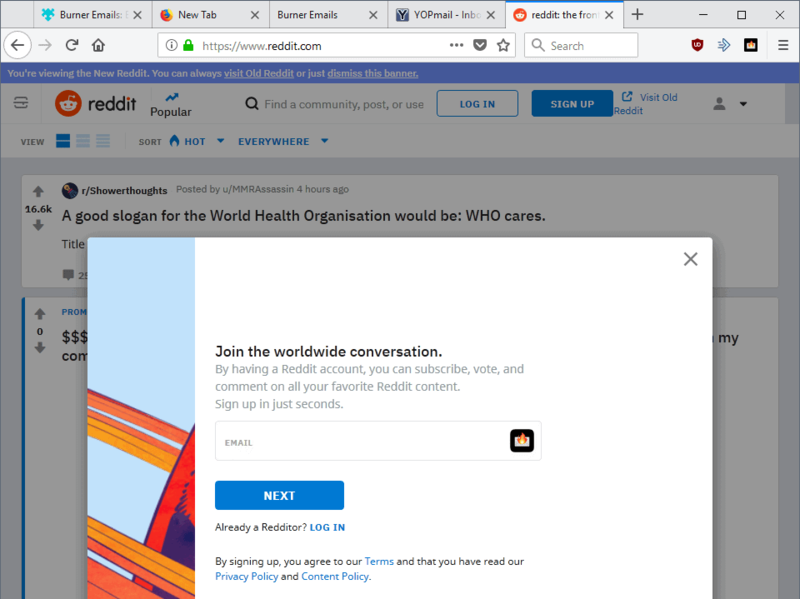 Besides, the extension itself does nothing except puts to clipboard your email address; and, yes, Access your data for all websites + Access browser tabs. I am sorry for your inconvenience, we fixed the UTF8 issue. You can deactivate or delete your account from the settings page. The extension generates burner email addresses and fills them in your email inputs and also allows you to search through your burner addresses and deactivate/delete them. It does much more than just copy to clipboard. It’s the main feature of the service. The only data that we access is the website domain, and we use that to generate the burner address. We need those permission in order to generate and fill in the address for you. If you are concerned about that, you don’t have to use the browser extension, you can create a custom burner email address from the web app and use that instead. I hope this made things more clear. hi why do i keep getting Recipient invalid when I try to get started?